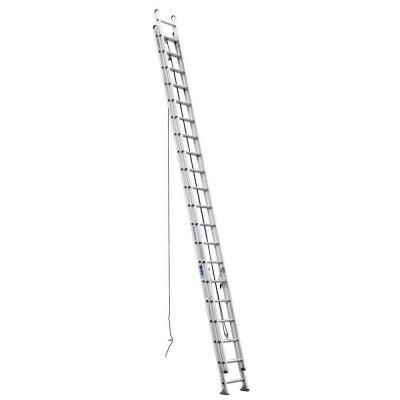 The D540-2 40 ft aluminum extension ladders have a duty rating of 300 pounds and feature the exclusive ALFLO® rung joint for a TWIST-PROOF® performance every time. The end caps are mar resistant and notched for easy separation of sections. Both the base and the fly sections can be used separately. Internal guides increase the ease of operation when raising and lowering. The feet are heavy-duty, self-aligning and free swinging for hard or penetrable surfaces. Rugged spring-loaded locks operate smoothly. TRACTION-TRED® D rungs are slip resistant. Duty rating changes to 375 pounds for 20 ft-32 ft models.